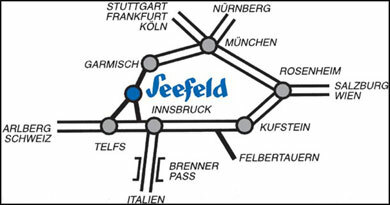 Seefeld, once a farming village, is situated on a south-facing plateau north of the river Inn. Nowadays Seefeld is a popular destination for walking as well as winter sports. Especially cross-country skiers find a true paradise with more than 280 km/174 miles of groomed ski tracks. It’s no wonder that the Nordic ski competitions for the Winter Olympics in 1964 and 1976 were held in Seefeld. Don’t forget to put your walking boots into your suitcase to explore more than 400 km/248 miles of hiking trails and paths. Seefeld is also frequented by pilgrims to visit the Parish Church and the Seekirchl, a beautiful little baroque church - the landmark of Seefeld. Seefeld has a lot to offer – spend some days and find out! Seefeld offers a wide selection of winter as well as summer sports. If you don’t like sports – don’t worry, you can simply stroll and explore the beautiful surroundings – or take a seat in a horse drawn sleigh and enjoy the scenery under warm blankets. Since the late Middle Ages, Seefeld is a pilgrimage destination. ‘The consecrated host wonder’ took place in 1384. In the Parish Church, you will find frescos and sculptures as well as an illustration of the ‘consecrated host wonder’. There is also a Gothic baptismal font with a Renaissance-wooden-crest to see. If you walk south west, you reach the landmark of Seefeld, the small and picturesque Pfarrkirchl, built in 1628. Skaters as well as classic cross country skiers find 283.5 km/176 miles of perfectly groomed cross- country ski tracks. In 1964 and 1976, when Innsbruck was hosting the Winter Olympics, Seefeld was the site of the ski competitions. In 1985, Seefeld was hosting the World Cross-Country Skiing Championships. Ski runs ranging in the altitude from 1200m.ü.M. to 2060 m/3937 ft. to 6759 ft. are perfect for beginners as we Gschwandtkopf’ and the ‘Rosshuette’ offer 33 uphill facilities. 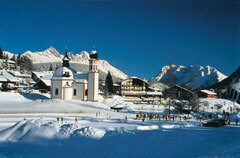 Due to its plateau location, Seefeld is very popular for classic as well as Nordic walking. 450 km/280 miles of hiking trails and mountain paths invite you to explore the breathtaking countryside. Up by cable car and down on foot is just one possibility. How about playing a round of golf at an altitude of 1300 m/4265 ft.? Take your golf clubs along and enjoy the beautiful scenery in a peaceful atmosphere. This 18-hole golf course was designed by the English architect Donald Harradine and leads you through wonderful scenery. Other Sports include hiking, mountain biking, tennis, swimming, soccer or snow tubing to just name a few. Not only a place to visit in bad weather. Visit the Olympia Sport and Congress Center also to get in shape, take a swim in the indoor or outdoor pools, relax in the sauna and get a soothing massage or a tan in the solarium. An ice skating rink in winter as well as a cinema and seminar and conference rooms round off the possibilities. Try your luck at the Casino Seefeld and play a hand of Black Jack, roll the ball at the roulette table or try one of 99 slot machines and hit the jackpot. Every Wednesday is Ladies Day where all female guests receive welcome chips, a glass of wine and a ticket for the daily drawing. Of course, men are welcome as well! Situated in the district of Tirol, Seefeld is just 21 km/13 miles or half an hour away from Innsbruck, 70 km/43 miles from Soelden, 84 km/52 miles from St. Anton or 200 km/124 miles from Salzburg. The closest airport is located in Innsbruck. There is also a train station in Seefeld.